As well as those mentioned above and by Beta Ray Bill there are others in the assembled heroes now scattered through time. Firelord, Quasar and Wraith are clearly visible. Cosmo the Space Dog and Major Victory probably came here from Nowhere before it was taken by the Black Order. I don't know who invited Howard the Duck. The possible hosts for Thanos on Eros' screen as well as Gamora are Black Panther, Daredevil, Deadpool, Ghost Rider, Hulk, Invisible Woman, Iron Man, Juggernaut, Loki, Luke Cage, Mephisto, Ms Marvel, Nick Fury Jr, Odin, She-Hulk, Thing and Venom plus 2 characters heavily obscured by word balloons which Marvel Wiki and comicbookdb tell me are Jean Grey and Sub-Mariner. There's also someone identified by Marvel Wiki as Knull, a villain from recent Venom comics, but who comicbookdb thinks is Dracula - I'm with the Wiki here. I don't know if it's relevant that there are also 2 blank images. Silver Surfer says the Knowhere cables are made of Korbinite steel. Beta Ray Bill is a Korbinite but I don't remember a particular metal being used for his armour, and his hammer Stormbreaker is made of Asgardian Uru. The Black Order used to work for Thanos in the lead-up to Secret Wars III. Black Swan wasn't originally a member but she linked up with Proxima Midnight in the Unworthy Thor mini-series after SWIII and then was part of the whole team working for Challenger in the Avengers: No Surrender arc which saw the demise of Supergiant. After that they all switched sides to work for Grandmaster in their own limited series. Black Swan and Proxima Midnight were working for Hela in Unworthy Thor so maybe that's why she picked the Order as her minions here. Starfox/Eros has called a meeting on Thanos' base-ship Sanctuary. He tells the assembled heroes that the Galaxy is in deep trouble. We see Odin brooding in the ruins of Old Asgard in flames (maybe a reference to War Of The Realms), there appears to be civil war amongst the Kree army, Deathbird is leading a rebellion against the Shi'ar Imperial Guard, Black Bolt is in prison after the Death Of Inhumans mini-series, we've just been through Infinity Wars and Galactus is back to being the World-Devourer. He also mentions ancient gods stirring from their slumber which may be referring to the 1st arc of Asgardians Of The Galaxy. Behind him is the headless body of his brother Thanos. Eros is sure that it *is* Thanos, even without the head, and he *is* dead. (Gamora decapitated him in Infinity Wars Prime.) He has brought everyone here to listen to Thanos' last message found on Sanctuary in a region called Super-Space, the hidden star fields of Sector X. A hologram of the Mad Titan tells them that he isn't leaving a will. He never believed anyone could kill him, but he took precautions just in case. He arranged for his consciousness to be automatically uploaded on his death and implanted into someone else. He looks forward to them trying to find him and stop his "Final Gauntlet". ... so we look in on Star-Lord and Groot in their spaceship heading to their old base Knowhere in the Rip. Peter Quill is getting drunk looking at an old wanted poster of the old team and what looks like a smashed cassette deck. Surly teenage Groot is trimming his spikes (and he's given himself a Mohican 'haircut'). Quill tries unsuccessfully to contact Knowhere but Groot tells him to look out the window. There's nothing where it should be except a few pieces of debris. Back on Sanctuary Eros says they're going to have to kill a lot of people to make sure Thanos doesn't come back. Beta Ray Bill protests that they can't trust anything Thanos says. But Silver Surfer and Gladiator of the Imperial Guard think they have to consider it. The Cosmic Ghost Rider regrets not having killed baby Thanos in #1 of his mini-series. Eros shows images of those he considers possible hosts for his brother, all of whom they may have to kill just to be safe. But he suggests they start with the most likely candidate Gamora (and we know she has Thanos talking to her in her head since she killed him). Phyla says she should have killed Gamora when she and Moondragon arrived here from their parallel timeline (IW#5). Heather Douglas tries to talk her lover down. And the Rider points out that Thanos could be 1 of the folks *here*. The argument is cut short by an attack by the missing Knowhere - a giant Celestial's head. Silver Surfer recognises it, and also the Korbinite steel cables that it has grabbed them with. He also recognises the horde of Thanos' Outriders boarding them and tells Bill to guard the body. Norrin Radd turns to the Ghost Rider who he's never met. The Rider says he's Frank Castle (the Punisher) and the Surfer will kill him in the far future. "We're good, but don't give me orders." Then the Black Order follow the Outriders in. 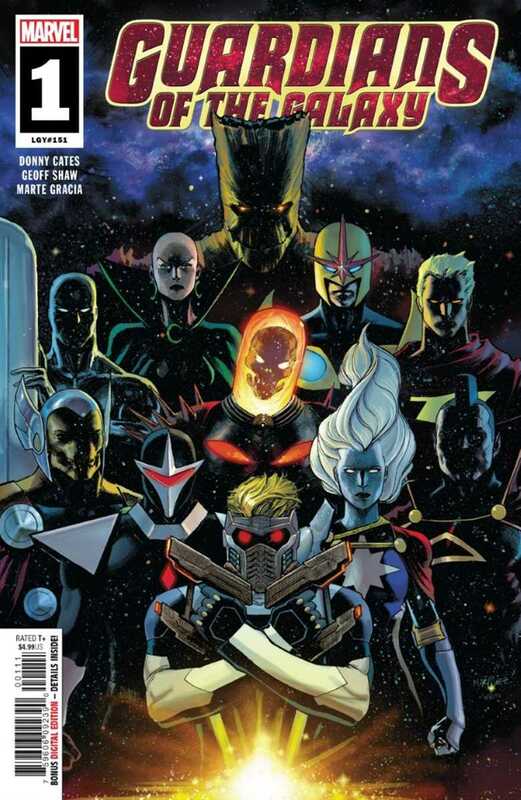 Quill and Groot have landed on a large chunk of the missing Knowhere, and they've called in the Nova Corps to report it gone. An alien Nova has turned up and doesn't believe the story of a missing Celestial head, with questions like "Where did you last see it?" and "Have you been drinking?" Under more questioning Peter claims not to be Star-Lord anymore and the Guardians have broken up - Drax is dead (I think the end of IW: Fallen Guardian suggests otherwise) and Gamora is a villain (the end of IW#6 suggests otherwise for that too). Groot says they don't want to talk about Rocket Raccoon (who it seems will be involved in the upcoming Avengers: No Road Home weekly mini). And their ship is no longer the Milano (named after Alyssa, and destroyed in Infinity Countdown #2), the new 1 is the Ryder (named after Winona, not the Earth Nova Richard). Then the Nova guy gets an alert that a Celestial head has been detected heading towards the big meeting on Thanos' ship. Peter hasn't head of this, but Groot says they got an invite but he didn't think it sounded interesting. The Nova guy leaves in his ship and tells them not to interfere. On Sanctuary Knowhere's cables latch on to Thanos' body. Proxima Midnight fires a missile into space which disgorges a small sphere which explodes ripping a hole in space. The Black Order escape in Knowhere with the body and everyone else is sucked into the hole. The Nova Corps arrive too late, but in time to see Beta Ray Bill's Asgardian hammer Stormbreaker emerge from the hole pulling behind it Cosmic Ghost Rider's mystic chain. The hammer ignores the Corps and heads straight to the Ryder which has just got there. Groot grabs the chain and Peter puts the ship in reverse. They pull out Beta Ray Bill who has Moondragon, Phyla Vell and Ghost Rider hanging on behind. Bill tells the pair that Corsair's Starjammers, Silver Surfer, the whole Imperial Guard and the Skrulls (all of them?) are lost. And the Black Order have Thanos' body. The Novas drop by to take Bill and co in for questioning. Quill demands to see a warrant to enter his ship but is told that his rights only extend to his crew. So he declares that this bunch is now the Guardians Of The Galaxy. Proxima Midnight, Black Dwarf, Black Swan, Corvus Glaive and Ebony Maw bring the body to their boss and report that their enemies are now scattered across time. They are told they must now also find the head because they need the whole deal in order to resurrect Thanos. Proxima protests that their earlier boss is now with his lover Death. And surely not even Hela Asgardian Goddess of Death would wage war against Death itself. Hela's smile suggests otherwise. Editor: Darren Shan. Editor-in-chief: C. B. Cebulski. Plus: Beta Ray Bill, Black Order, Captain Marvel (Phyla Vell), Cosmic Ghost Rider (Frank Castle), Eros, Gladiator, Hela (Goddess of Death), Imperial Guard, Moondragon (of Infinity Wars), Nova Corps, Skrulls, Starjammers.